The University of Kansas Alumni Association Southwest Chapter hosted their golf tournament at the Liberal Country Club Friday. The golf tournament began at 1:00 PM with dinner during the evening. 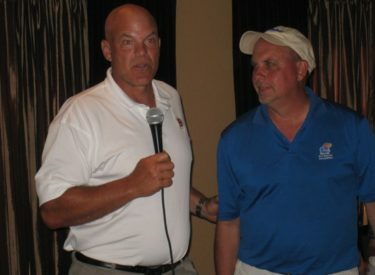 KU football recruiting coordinator Brandon Blaney, radio announcer David Lawrence, former Jayhawk linebacker Banks Floodman, associate athletic director Jim Marciony, and assistant athletic director Pat Henderson spoke to the crowd Friday evening at the country club. The event raised money for the alumni association Blaney, Lawrence, and Marciony will be guests on the Sportsguys during future shows. The Sportsguys airs weekday mornings between 7:37 and 9:00 AM on Talkradio 1270 and kscb.net. The alumni association’s Mike Davis was a guest on the show Friday morning along with members of the alumni association and former KU football players Danny Lewis and Marcus Hicks. Heather Peterson is the alumni association’s director of Kansas programs and he was a guest on the show. Peterson is also a Hugoton native. KU’s football and men’s basketball games will air this year on Talkradio 1270.